Memphis Sound member Samantha Stepp submitted this photo and caption. 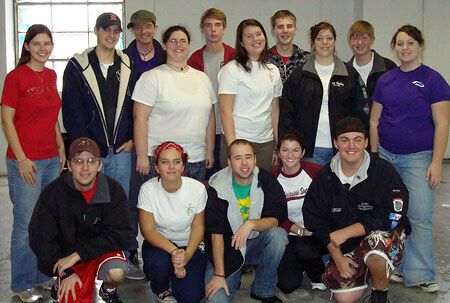 This is a photo from Memphis Sound's January rehearsal camp where 2007 corps members decided to have a little reunion. Usually we have our corps banquet before the fall auditions, but instead held it during the summer on the beach in California after the '07 World Championships. Front row from left: Tom (contra '07), Fallon (mellophone '07), Cody (soprano '03, baritone '04-'06), Audra (color guard '05, assistant drum major '06), Justin (front ensemble '07). Back row from left: Laurel (soprano '06), Jacob (baritone '05-'06), Sean (soprano '07), Mindy (baritone '06), Ben (cymbals '05, snare '07), Samantha (color guard '04-'07), Jason (front ensemble '07), Rachel (baritone '05-'07), Chase (front ensemble '07), Amber (front ensemble '06-'07). Others who attended who are not pictured: John (mellophone '07), Sarah Ann (front ensemble '07), Patrick (soprano '04, '05, '07), Chris (soprano '07), Roby (soprano '07), Greg (mello '03-'04). Sorry if I missed anyone! It was really good seeing everyone again.